Do you think you have cataracts? Are you seeking a San Diego Cataract Surgeon? If this is the case we would like to better help you undertsand cataracts and the cataract surgery process known as Phacoemulsification. We live a significant portion of our lives with a clear lens that enables clear vision. When our lens is clear we accurately process visual stimuli. As your eye begins to age various protein start to clump together causing opacity and density. The natural crystalline lens in your eye starts to get cloudy. Many patients have described this sensation as trying to look through a foggy window or a piece of wax paper. Once this clouding has occurred and the lens has become opacified you have developed a cataract. 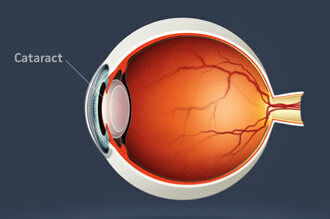 Cataracts actually prevent light from reaching your retina, which processes images to the brain. Instead, the light that does not pass through your lens gets scattered, blurred, and distorted, resulting in a gradual deterioration of your vision. Cataracts will cause you to perceive images as less sharp, crisp, and vivid. Colors will be subdued, and you may experience glare around lights. When not properly treated, cataracts can lead to blindness. Cataracts are caused mainly by age, trauma, heredity, and exposure to ultraviolet radiation. ; Cataracts can also occur as a result of eye disease, after the use of certain medications, or as a result of medical conditions such as diabetes. What are my options if I have a cataract? Most people do not realize how much cataract surgery has advanced over the last 10 years. Not only have there been developments in the equipment but also with the lens implants themselves. The San Diego Eye & Laser Center offers latest technology involving no-stitch, no needle cataract surgery using small incision Phacoemulsification. Millions of people undergo cataract surgery every year and have successful surgeries.